Center Thomas Welsh talks about playing with Aaron Holiday and Jaylen Hands, his preference between a between-the-legs pass and windmill dunk and how the Bruins were able to learn from their previous loss to Stanford. Center Thomas Welsh talks about how he could have been better down the stretch against Colorado, the importance of this weekend’s road trip to the Oregon schools and how much longer he might have to wear the mask. Guard Aaron Holiday and center Thomas Welsh talk about UCLA’s offensive struggles against Colorado, Welsh’s 10-point personal run in the second half and how the Bruins can find consistency in Pac-12 play. Center Thomas Welsh talks about the state of his face after taking a sharp elbow to the nose last week, his thoughts on Utah and the impacts of GG Goloman and Alex Olesinski. 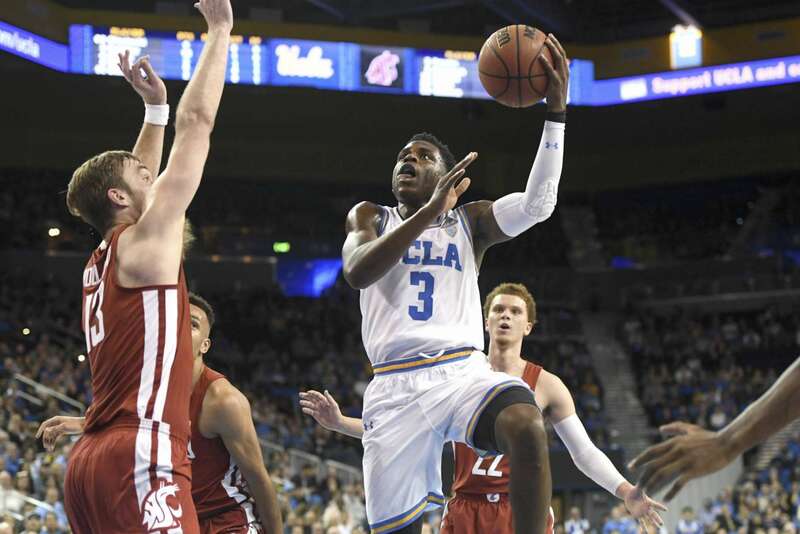 Aaron Holiday scored a career-high 33 points with 11 rebounds, four assists and no turnovers to lead UCLA to a 96-82 victory over Washington State in Pauley Pavilion on Friday. With 23 points in the first half, Holiday joined UCLA’s 1,000-point club before the break and was joined in the second half by Thomas Welsh. The senior center had 12 points and 14 rebounds with three assists. They are the 55th and 56th players in UCLA history, respectively, to record 1,000 career points. UCLA’s three freshmen, Jaylen Hands, Kris Wilkes and Chris Smith, scored 26 of their combined 37 points in the second half. Hands led the young trio with 19 points, four assists and only one turnover as the Bruins (10-3, 1-0 Pac-12) tied a season-low for turnovers with seven. A 3-pointer from Carter Skaggs midway through the second half pulled Washington State (8-5, 0-1 Pac-12) within two after the Cougars had trailed by as many as 11 earlier in the half. The Bruins responded with a 13-2 run quell any comeback efforts. More from UCLA’s first Pac-12 win of the season (from staff reporter Tarek Fattal).